A lot of the pasta sauces I tend to make are slow braises such as this bolognese or this chicken liver, veal and porcini ragu but sometimes the simplest things are often the best and in this less-is-more-pasta sauce of mixed seafood, chilli, fresh tomatoes and saffron that’s certainly the case. 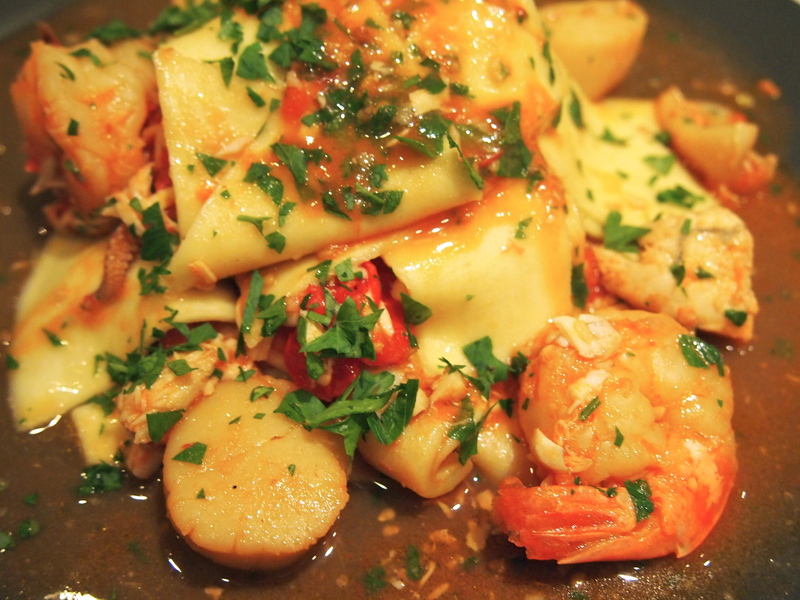 A short list of ingredients and a fast cooked sauce yield an amazing amount of flavour. This is quick enough for a midweek meal – dinner can literally be on the table in 30 minutes but impressive enough for entertaining. 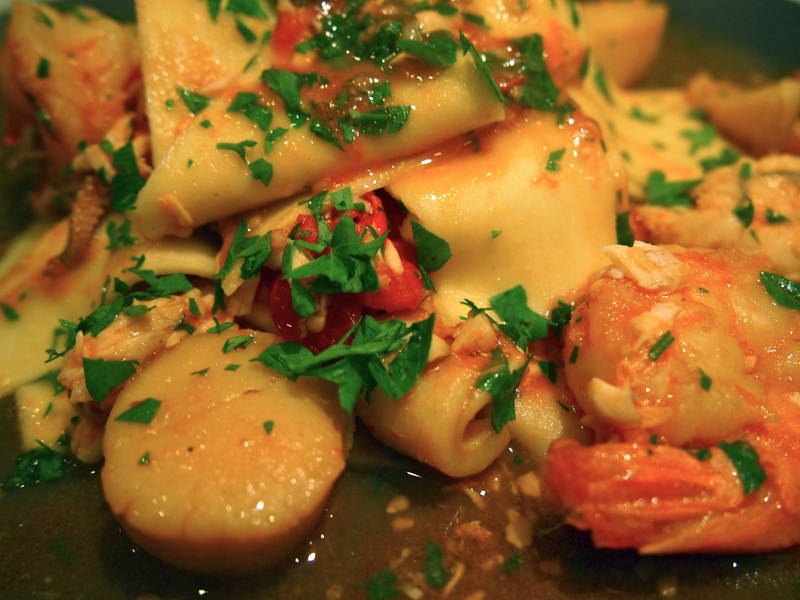 You could team this sauce with linguine as well but I love the look and taste of these pasta rags which wrap themselves around the sauce and the seafood almost like open ravioli. 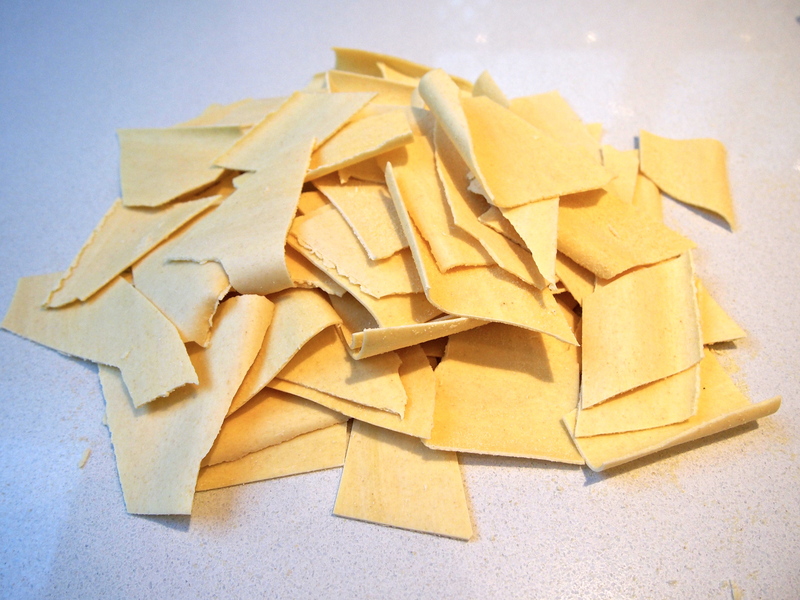 If you have the time and feel like making your own fresh pasta sheets that’s great but as I love this dish for it’s ease and simplicity I use ready made fresh lasagne sheets and cut them into uneven and freestyle rags or stracci as they’re called in Italian. For even more wow factor I’ve also made this with squid ink lasagne sheets which can be special ordered from Pastabilities if you live in Sydney – it looks stunning and tastes even better! Cut each lasagne sheet in to large free form shapes/rags – anything from large triangles, diamonds or strips, just don’t make them too small. 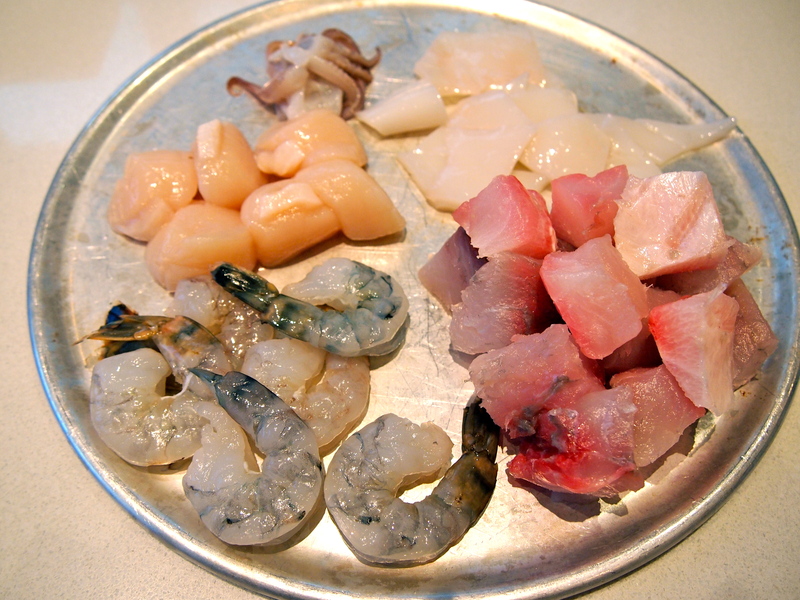 Bring a large pan of well salted water to the boil. 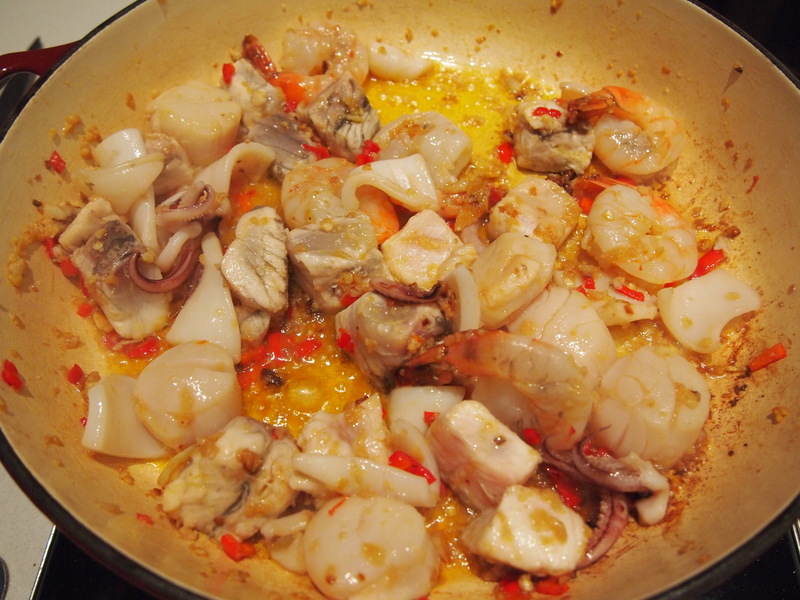 Whilst the water is boiling place the garlic, chilli and a good amount of olive oil, at least ¼ of a cup, in a large narrow sided sauté pan or fry pan. Turn the heat to medium and slowly cook the garlic and chilli until just beginning to colour. 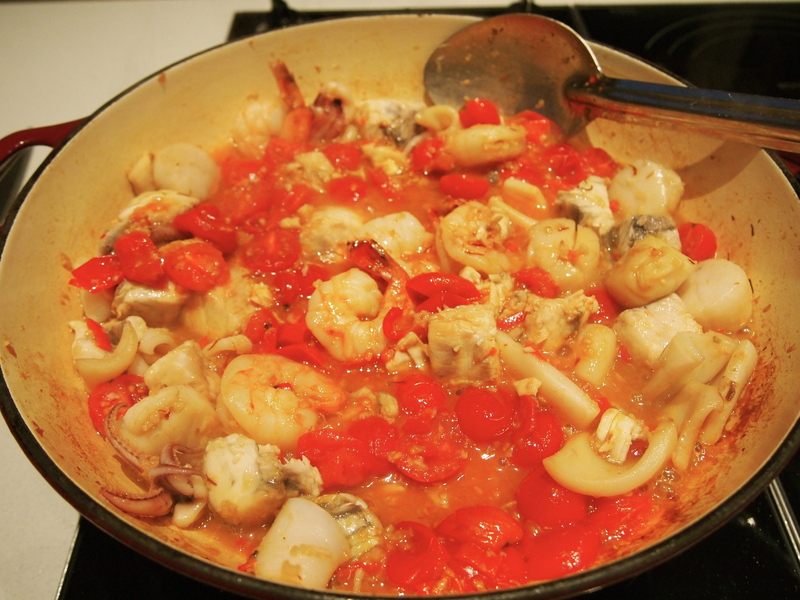 Increase the heat slightly and add the seafood along with a generous pinch of salt; cook until the prawns are almost opaque – the seafood doesn’t need to be cooked all the way through at this point. Add the vermouth/white wine and let it bubble away and reduce slightly. Add the tomatoes and saffron and with the back of a spoon press down on each tomato half so that it collapses and releases its juice. 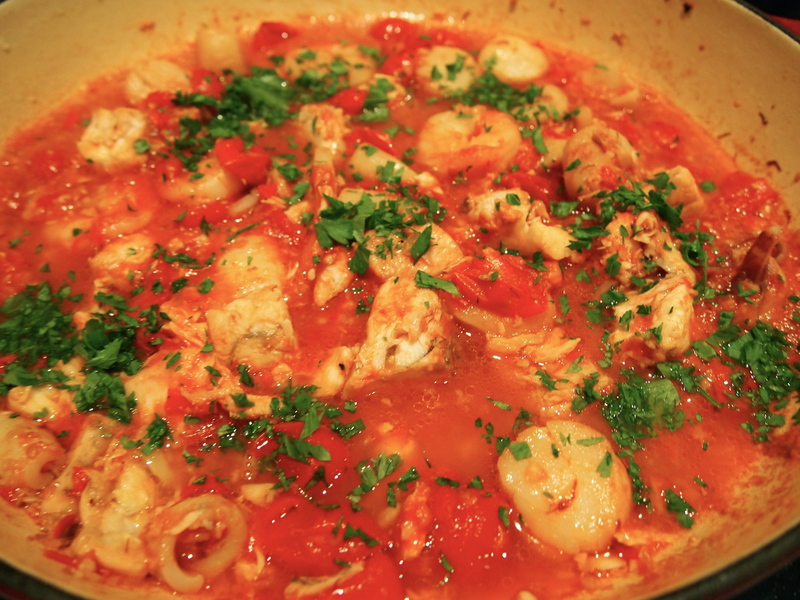 Add the tomato passata and little of the boiling pasta water. Bring to a simmer, lower the heat and give everything a gentle but thorough stir. Let the sauce simmer for a few moments on low heat. Add most of the chopped parsley, taste and add more salt if required. Add the pasta to the boiling water and when cooked (it won’t take long for fresh pasta) drain and reserve a cup of the cooking water. Add the pasta to the sauce and gently toss it through. The pasta will start to soak up the pasta sauce so add as much of the reserved pasta water as required to avoid the sauce drying out. To serve, place the pasta on large warmed plates making sure there is an even amount of seafood, pasta and sauce in each serving. Sprinkle with the remaining parsley and a drizzle of your best extra virgin olive oil and serve straight away. This looks and sounds amazing. When is your cookbook coming . . . ?